Is Homemade Slime Safe or Toxic? Slime is a new trend among tweens that has been in the news recently due to possible dangers from playing with it. You cannot believe your eyes! You find your tween playing with a friend and neither of them has a phone or electronic device in their hands. They are actually screen-less, yet they are having FUN, up to their elbows in gooey slime. Do-It-Yourself slime is quite the trend, and making it is as much fun as playing with it. It’s gone a step beyond the plain green goo sold in small trash-can-like containers. Today’s slime is “designer slime” made by adding food coloring, beads, glitter, Styrofoam, shaving cream (makes the slime fluffy—who knew? ), iron filings, and the kitchen sink. Some tweens have become budding entrepreneurs by selling and trading their personal concoction. This all seemed like harmless fun, but now there are stories in the news and on social media about the toxic dangers of slime – everything from skin rashes and burns, to really serious problems like seizures and future reproductive failure. Should you immediately put a halt to the slime craze in your home? As health care professionals, we rely on scientific evidence for answers, not the news and especially not social media. The health questions involve borax, one of the ingredients in one type of slime. Here is what we know. The recipes vary, and go by different names. Slime, sometimes called flubber, is the basic goop made with household products borax, white school glue, and water. How do we get slime from glue? School glue is actually water with a small amount of a chemical called polyvinyl acetate in it. In a way, it is basically an incomplete plastic. The polyvinyl acetate molecules in school glue move separately past each other while the glue is wet, but set firm when it is dry. This is what sticks things together. When borax in water meets these same glue molecules, it forms countless weak bonds between them (like loose connections), so they don’t move past each other as easily. They move together, but are not set. The material is now a slowly flowing, elastic polymer, like a soft, goopy plastic. See figure below. Instead of polyvinyl acetate in school glue, the most serious slime makers may obtain polyvinyl alcohol, a related chemical, said to make more and better slime. But, they still need the borax. GAK is a related polymer except liquid laundry starch is used to stick the white school glue molecules together instead of borax. Glue putty/silly putty can be made with corn starch and white school glue. The properties are slightly different, but the fun is the same and there is a safety benefit to ditching the borax. These are made from food ingredients only and are the safest of all for young children. Oobleck is made with cornstarch and water, or cornstarch and sweetened condensed milk. Food coloring or flavored sugar-free gelatin can be added for color and flavor. Another type of edible slime that can be made by an adult for young children uses a dietary fiber supplement of crushed psyllium such as Metamucil mixed with powdered drink mix such as Kool Aid and water. Borax is a laundry powder that is sometimes used to brighten whites, reduce odors, and disinfect. It is also found in various “natural” household remedies and cleaning products. Boric acid is closely related to borax. Their possible toxic health effects are the same. What harm can borax do? If eaten once in a small amount, the answer is “not much.” A harmless amount for a 2 year old is about a teaspoonful of borax, an older child, several teaspoonsful, and a teen or adult, several tablespoonsful. There is actually more risk of becoming ill when borax is encountered day after day, either by ingestion or getting in through damaged skin. Symptoms of too much borax getting into the body are stomach upset, nausea, vomiting, and diarrhea, rarely headache, lethargy, irritability, and restlessness. The most dramatic evidence of too much borax is skin redness, often called a “boiled lobster” rash. Afterwards, the red skin peels off, especially on the palms and soles. This red, peeling skin is supposedly the problem that sounded the current alarm. It may very well be true in this one case, but it seems likely some excessive exposure to borax was involved, and not just the regular making and playing with slime. What about pregnant women and future fertility? Animal studies suggest that constant exposure over a very long time to fairly high levels of boron chemicals in food or water can make males sterile, and slow the growth of unborn babies. So far, studies in people who work with boron chemicals or have high boron content in their food or water don’t find the same problem. However, the best thing to do is to limit everyone’s exposure to boron chemicals to a very safe amount. This amount in practical terms is actually very small. If just one quarter of a teaspoon of borax, spread out a little every day for a month, got *inside* the body through the stomach, we’re at the safety level for one 50-pound 8 year old. A regular batch of slime uses only a teaspoonful of borax at a time, but is still very important that adults be involved and rules are followed. 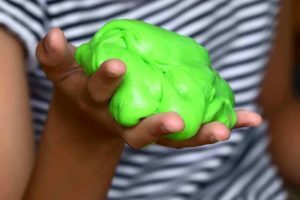 Is borax or slime dangerous for my kids to handle? Borax is easily absorbed through the stomach, but it doesn’t cross healthy skin well. Absorption into the body is possible if the skin is damaged, such as open wounds, burns, irritated or peeling skin, eczema or similar skin problems. Dust particles from the powdered borax can get into the air, and land in eyes or get breathed inside the nose or throat. This could cause some slight irritation. Keep in mind that once the slime appears during the mixing, the glue and the borax are largely gone, wrapped up in making something new. Skin contact with slime itself is not the same thing as skin contact with borax. On the other hand, handling it hours upon hours at a time, all the time, is probably not a good idea. Slime in the mouth? Not the end of the world, but probably not a good idea. Do my kids have to say good bye to the slime? Probably not, as long as some ground rules are followed. This is a parental decision; you know what is best for your child. If you choose to allow slime manufacture and play in your home, there are ways to keep kids safe by minimizing their exposure to the borax. Young children or others who may put the slime in their mouth should play only with edible slime made with food. Non-borax recipes that use starch are safer overall than the ones that use borax. Pregnant women should avoid borax-slime recipes. Making slime with borax should be supervised by an adult; it is a chemical and needs to be treated as such. It is best to use disposable dishes and silverware for making slime rather than every-day kitchen dishes that normally hold food or beverages. Scooping the borax from the container should be done carefully to keep dust out of the air and prevent spilling. If it does spill, clean powder up by sweeping, and then wiping down the spill area with a wet paper towel to pick up the remaining dust. Sweepings and paper towels can go in the household trash. Be aware that the borax in water is a drinking accident waiting to happen. Don’t leave the solution in a container that someone could mistake for a beverage. Pour unused or leftover solution into the sink drain immediately. Ideally, gloves should be worn while mixing the borax-slime to keep the skin protected from the borax. After all the mixing is done, including the colors, beads, glitter, etc., take off the gloves and wash hands and arms thoroughly, but gently with soap and water. ABSOLUTELY there should be no eating or drinking or food preparation while making or playing with borax-slime. Since small amounts of material can get into the mouth from the fingers, why take the chance of any amount being eaten? Consider limiting the amount of time your child plays with the borax-slime. There is no hard and fast rule, but thirty minutes to an hour a day seems reasonable. Always wash hands after touching or playing with slime. If you have any questions about your child being exposed to slime, call the Missouri Poison Center at 1-800-222-1222. The poison center is open all day, every day for poisoning emergencies and questions.